This cap is designed to fit an extra small head. However, if you need a larger size, you can always experiment with a thicker yarn and larger hook size. 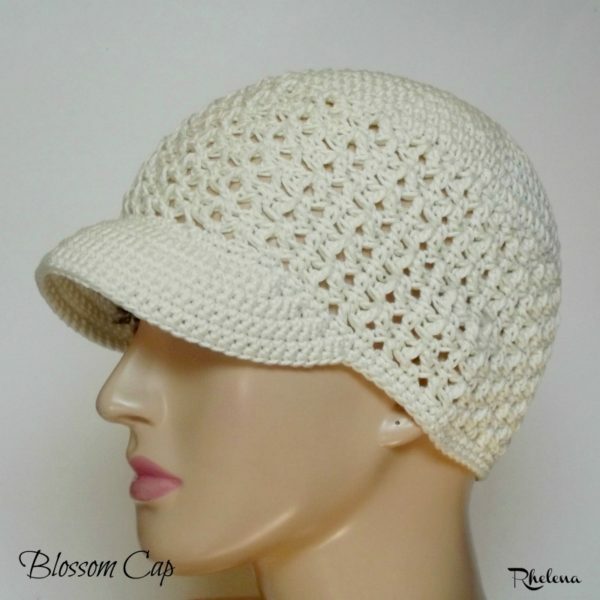 The cap shown here is crocheted in a cotton material, which makes it perfect for the summer. It’s great for keeping the sun out of the eyes without being too hot. And, if you like, you can omit the brim and wear it as a super cool beanie. In that case, you could try crocheting it in an acrylic material for a cozy winter hat. Check out the tutorial for the Blossom Stitch. Yarn: Butterfly Mercerized Cotton – DK (#3) 1 125gr./249yard skein. Gauge: 1.25″ over first 2 rnds. 4″ over 19 sts/chs throughout pattern. 3″ over 10 dc/v-st rows. Finished Size: Laying flat, it’s approximately 18″ in circumference and 7″ top to bottom, not counting the brim. Hat will stretch to fit Teen/XSmall Adult. V-Stitch (V-st): (dc, ch 1, dc) in designated chain or space. Rnds 15-23: Rep rnds 13 & 14 ending with Rnd 13 at Rnd 23. 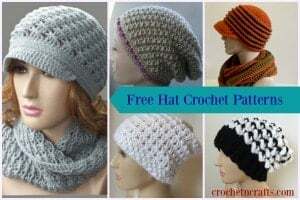 If you enjoyed this hat pattern, you might also enjoy a browse through the crochet hats on CPB. want a simple beanie with a brim . Thank you , Mary D.